While many companies are experiencing inadequate talent pools due to the low unemployment rate, there could be some other contributing factors for a shrunken candidate pool. One of the most common culprits for a lackluster talent pool is the job description in your posting. Across industries, job titles can be somewhat fickle. Three professionals who have the same daily responsibilities may have three different titles. For example, a content writer, a content marketing specialist, and a copywriter are all essentially the same role, but will generate a different batch of candidates when used in a job description. To attract the right pool of candidates, you want a title that both attracts and describes the role. Some companies get themselves into trouble by titling roles too creatively. While being the Director of First Impressions sounds great and would make someone feel an increased sense of value, you’re going to have a difficult time attracting candidates with receptionist and assistant experience, as they will never think to search for Director of First Impressions when looking for a job. When there are multiple titles being used to describe the same role, try to use the one with the highest search volume, as that is an indicator of what candidates are searching when looking for new opportunities. For example, in the earlier scenario, you’d want the title of your job description to be a copywriter. The goal of your job description is to generate interest in the position and to solicit as many qualified applicants as possible. While there are always going to be deal-breaker requirements for roles, be careful on how many you list. A common job description mistake that companies make is limiting applicants by turning candidates away with too lofty of requirements. This is especially important in today’s labor market. If you’re hiring a management position where you traditionally require 7-10 years of industry experience, in today’s market you’ll want to drop that standard and lower the pedestal to 5 years. By letting in a few more candidates with less experience in the tent, you might end up finding a better overall fit in terms of growth potential and culture match. Another way to grow the applicant pool is to avoid using numbers altogether. Instead of asking for 5-7 years of sales experience, you could phrase the requirement as a strong background in sales. You can quickly weed out the candidates with insufficient experience during your initial screening process and resume reading. While most companies have a dedicated employment branding page on their website, many forget to include employment branding in individual job descriptions. Never forget to include a sales pitch for why prospective applicants should want to want to work for your company. Implementing the above tips will help increase the number of candidates applying to your posting. 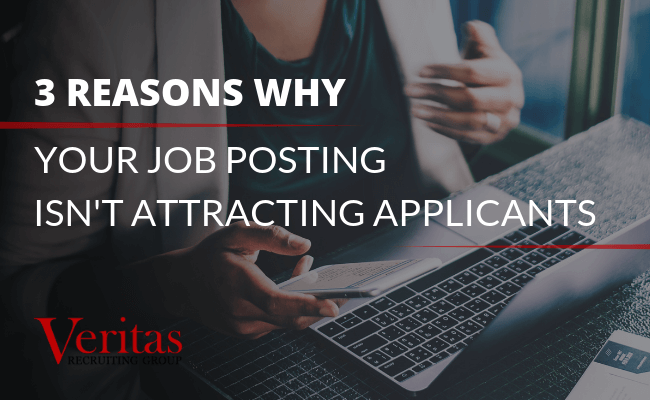 If you still aren’t satisfied with the quality of the talent pool, the next step is to partner with a dedicated staffing and recruiting firm like Veritas Recruiting Group. If you’re looking for an accounting, finance, or corporate administrative professional candidate, Veritas Recruiting Group is here to help. Learn more about the types of positions we staff and contact us today to get the search process started.